← What We’re Wearing Today! A "What We're Wearing Today" photo we shot with Elaine a few months ago. 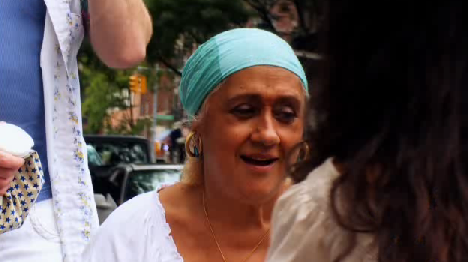 One of the funniest vingnettes on our show concerned Elisa’s meeting with a “psychic” named Elaine. We knew Elaine prior to the shoot because her “shop” was located right near Chelsea Girl, in Soho, only ours is at 186 Spring Street (near Thompson) at the intersection of Thompson and hers was in the intersection of Spring and Thompson. Literally. She would set up a placard and a little table right between the garbage can and the mailbox on the corner. Wasn’t it Oscar Wilde who said “we’re all in the gutter but some of us are looking at the stars”? Well, Elaine was actually in the gutter as she read the stars of New Jersey girls for $10. But I digress. To us, Elaine was a friendly, colorful neighborhood fixture. Someone we always said “good morning” to or kibbitzed with while waiting for the light to change. 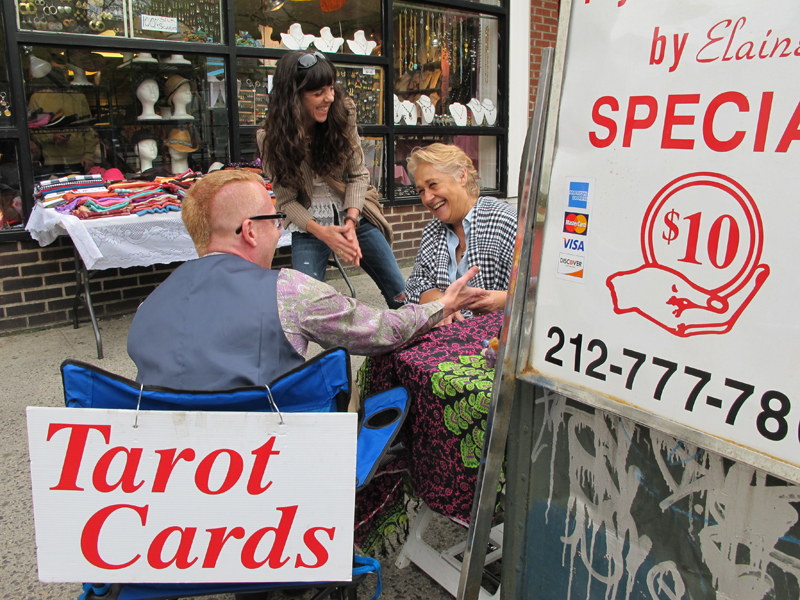 We had never asked her to do a reading for us because while I wouldn’t say that Elisa and I are completely non-believers in that sort of thing, we do believe that gifted psychics do not have to set up on a street corner! Call us snobby, we think it’s just common sense. All that remained of Elaine for two weeks. Then, nothin'. Anyway, when we were filming “Girls Who Like Boys” and were brainstorming ideas about how to dramatize Elisa’s apprehensiveness about going on her first blind date, on camera, someone came up with the idea of going to Elaine’s for a reading so Elisa could get some insight into what she might look forward to on the date. On the day of shooting, Elaine amped up the the whole gypsy thing for the camera, even wearing a Dark Lady scarf on her head, huge gold hoop earrings and rings on every finger. As those of you who saw the episode know, though I think Elaine is a fraud (though an endearing one – especially with the headscarf), she and I were both in agreement that Elisa’s blind date was a total waste of time. ”What do you need with that?” Elaine asked Elisa in her broad, outer-borough working girl accent, “You don’t need some odd man comin’ around.” When Elisa pressed Elaine for specifics about the date, Elaine told her that her date would “have Venus in ‘em,” which I thought, if correct, might necessitate a gastroenterologist. What Elaine meant was that the guy would be a Libra. This impressed Elisa as a sign that Elaine might, indeed, truly have “the gift”. This impressed me as a sign that Elaine had a one in twelve chance of having made an accurate guess. Elaine as she appeared on, "Girls Who Like Boys Who Like Boys." In any event, if you saw the show, you know the guy did turn out to be a Libra! The whole sequence was quite fun, I think, and one of the best examples of our schtick, which is not really schtick because it’s how we really are. 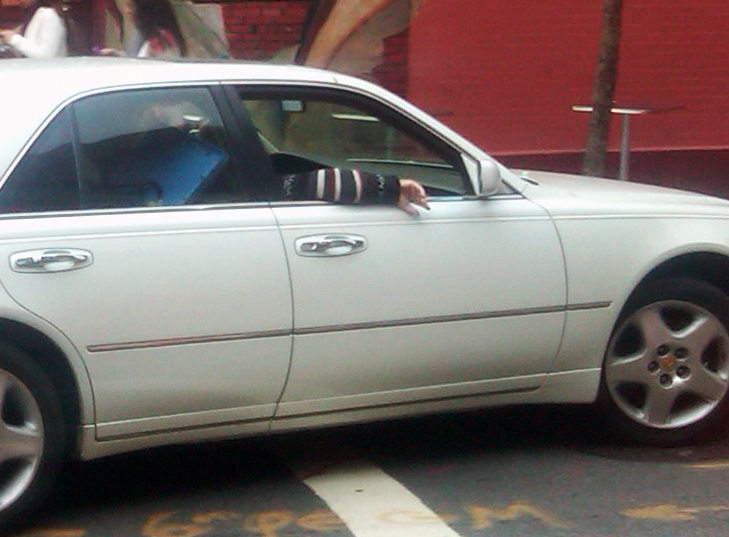 Elaine's hand hung out her car window as her husband drove her away from us forever. 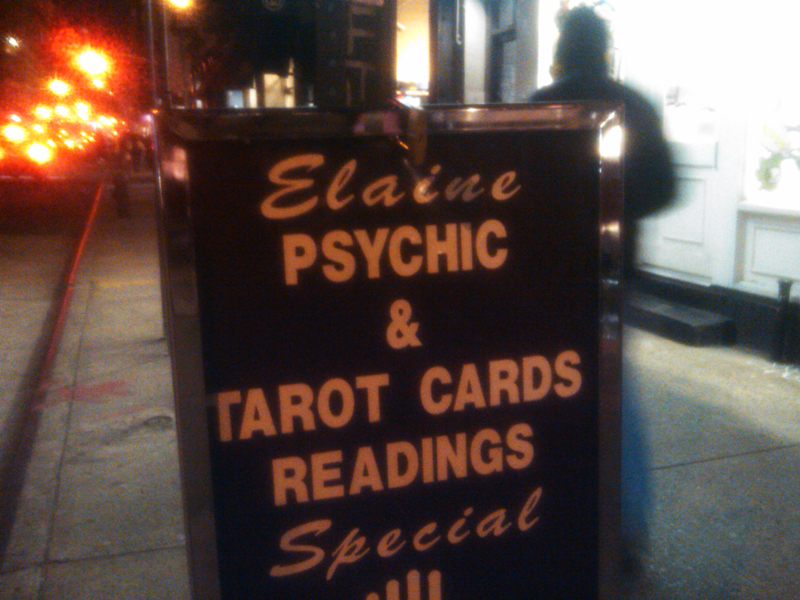 Elaine periodically comes back to visit us (and surreptitiously leaves a stack of “Psychic Reading by Elaine!” cards next to our door.) Although Elisa’s blind date worked out well and she continued to see the guy for a few months, Elaine stuck by her claim that the blind date was a bad idea and got some satisfaction when Elisa told her they broke up. Elisa's "spiritual advisor" visits us at Chelsea Girl from time to time and Elisa badgers her with questions. This entry was posted in Chelsea Girl Vintage, David Munk, Elisa Casas, Girls Who Like Boys Who Like Boys, GWLBWLB. Bookmark the permalink.